Aww, they grow up so fast! 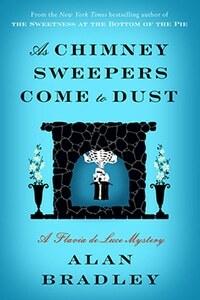 I can hardly believe we’re already up to #7 in the Flavia de Luce mysteries. If you haven’t read any of these charming English confections yet, I’ll stop you here and recommend that you start with The Sweetness at the Bottom of the Pie, author Alan Bradley’s award-winning debut novel. This review presumes that you’re current on Flavia’s eventful life, so stop right here if you don’t want any spoilers on books 1–6. You have been warned. A quick recap: Flavia de Luce is a precocious 12-year-old amateur sleuth honing her skills in the startlingly homicide-filled English village of Bishop’s Lacey. When she’s not bickering with her older sisters or rattling around the countryside on her bike, Flavia can be found in a top-secret science lab hidden in a corner of the family’s crumbling mansion, brewing vile substances and conducting chemical experiments. Flavia has always keenly felt the loss of her missing-presumed-dead adventuress mother, Harriet, whom she has no memories of — in the past, Flavia’s sisters have been quite cruel about it, withholding information and even blaming Flavia for their mother’s death. But as Flavia grows up, she learns that her mother’s death was no mere accident: Harriet belonged to a secret society called the Nide, a group that’s now recruiting Flavia. You better believe this is what Flavia (and probably many readers) has been waiting her whole life to hear! So what’s next? Surprisingly, this installment in the series takes a step back, putting the brakes on the whole secret-society thing in favor of a rather small-potatoes boarding-school mystery. Oh, it starts off with an agreeably ghastly setup, as a charred and mummified corpse falls out of Flavia’s bedroom chimney. Several of the schools students have vanished without a trace in recent years, and rumors are going around that Miss Bodycote’s Female Academy is haunted. Naturally, Flavia latches on to the mystery, finding comforting familiarity in her investigations when everything else in her life has suddenly changed. And if this were the kind of cozy mystery series where time never advances and Flavia is eternally a plucky tween sleuth, that would be sufficient. But now that Bradley has raised the stakes with tantalizing talk of secret societies and epic battles of good and evil, there’s no going back, and failing to significantly develop the Nide subplot gives Dust the distinct feeling of treading water. One of the more poignant features of this series has been watching Flavia mature from a socially clueless tomboy into a young adult, with a growing awareness that she’s dancing around the edges of female mysteries and the sisterhood of women that she has long rebelled against. Sending her off to a finishing school — even though the place isn’t quite as it first appears — is another hint of Flavia’s approaching responsibility and her duty to her mother’s work. I wish this installment had kept the momentum going rather than temporarily stalling out, but hopefully the next volume in the series will bring our true initiation into the secrets of Flavia’s destiny.